Milwaukee Brewers outfielder Nyjer Morgan is getting back to his hockey roots. Morgan, who goes by the alter-ego Tony Plush, will lace up his skates and join the San Jose Sharks on Wednesday for practice. Milwaukee Brewers outfielder Nyjer Morgan is getting back to his hockey roots. Morgan, who goes by the alter-ego Tony Plush, will lace up his skates and join the San Jose Sharks on Wednesday for practice. The 31-year-old grew up in the Bay Area and says he's a devout Sharks fan. "I'm really excited to get on the ice with the team," said Morgan in a statement. "I've been a diehard fan since the team came to San Jose in 1991. I will never forget the George Kingston and Patty Falloon days. I'm not sure the guys are ready for me!" Morgan is no stranger to hockey rinks having played with the Western Hockey League's Regina Pats for seven games during the 1999-00 season. He scored two goals and registered 20 penalty minutes during that span. "We're excited to see what he can do out here," said Sharks captain Joe Thornton. "We knew he had a hockey background and when we saw him on Jim Rome wearing our sweater, we wanted to invite him to get on the ice with us." Morgan decided after that season to focus solely on a baseball career and was selected by the Pittsburgh Pirates in the 33rd round of the 2002 MLB draft. Since his major league debut in September 2007, he's posted a career .288 batting average with 114 RBI and 105 stolen bases in 461 career regular-season games. 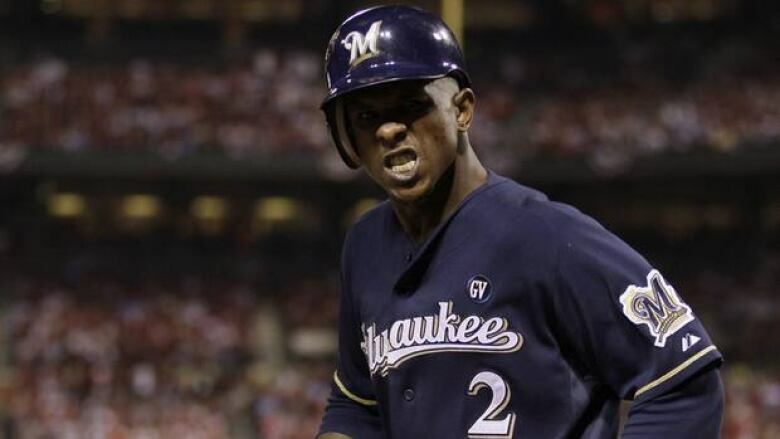 Morgan, who joined Milwaukee last year, hit a dramatic 10th inning walk-off hit in Game 5 of the NLDS against Arizona giving the Brewers their first playoff series win since 1982.